November 10th and 11th saw the 2016 Web Summit take place. An annual technology conference, 2016 marked the event’s first appearance at its new home in Lisbon, Portugal. 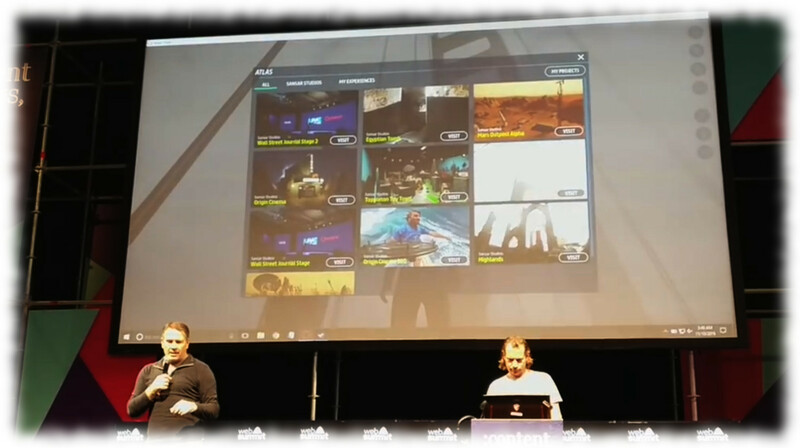 However, as with the 2015, it included a look inside Linden Lab’s Sansar platform, this year presented by the Lab’s CEO Ebbe Altberg and Bjorn Laurin, VP of Product at the Lab. The official Web Summit video of the demonstration has yet to appear (if indeed they filmed any of the sessions). However, courtesy of Loki Eliot, I was steered towards a video of the presentation taken by an attendee at the summit: Miguel Mimoso Correia, which I’ve taken the liberty of embedding below, as there are a number of points of interest. The first is seeing Sansar operating in a purely third-person, keyboard / mouse driven mode. While the platform is obviously primarily geared to VR HMDs and controllers, it’s nevertheless good to get a better look and feel for how it might also be used by people without such hardware. Of particular interest to me in this was the suggestion that users might have relatively free camera placement when moving their avatar around in a third-person view, rather then their camera being locked into a “default” view, as with Second Life. In the “highlands” scene, for example, the camera is clearly set low down, affording a good view of the avatar and the hilly terrain around him as he walks through it. Meanwhile, in the Mars scene, the camera position is noticeably higher relative to the avatar, giving a broader view of the flatter landscape. The avatars also appear to respond more naturally as well – note how Bjorn’s avatar casually rests one foot on the dais in the 360-degree video sphere when he stops walking. With VR, we found one thing that’s uncomfortable for some people is to just use a thumb stick, like on an Xbox controller or whatever, and just walk around …. because … you can start spinning the world around. And when your body’s not moving, but the world is moving, some people can get nausea or something like that. So … the way we prefer to move around in VR [in Sansar], is that we actually have with the controllers, a way to point to a spot in front of us with an arrow … and we just jump to that spot. For those used to Second Life, there might be something of a “bleah” response to this description; but really, it’s not that much different to the convenience of SL’s double-click to teleport option. However, that said, it would be nice to see if there’s also a Sansar equivalent to SL’s “single click to walk” – something which might be preferable to having other people seeing avatars hopping around, as suggested in Ebbe’s explanation. 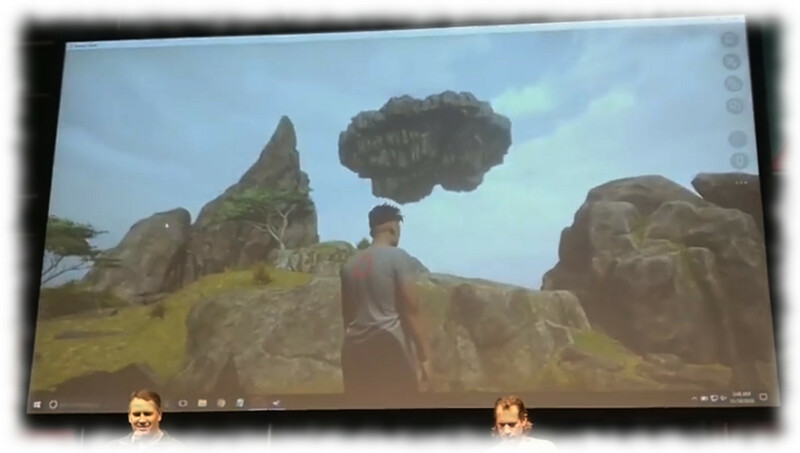 Elsewhere, we get to see a little of the dynamic capabilities in Sansar, which employ some of the platform’s physics. The creative aspects of Sansar are only briefly looked at, and for those who have been following Sansar reports, offers nothing of significance. However, it is somewhat interesting to learn that the familiar Golden Gate bridge seen in Sansar is actually a TurboSquid model, underlining the ability for models to be purchased from other mediums and pulled into Sansar. But for me, what is more interesting – if only because it offers room for speculation. Is the use of the term “Sansar Studios”, which appears as each scene is loading. Why not “Linden Lab (or even “Linden Research”)? 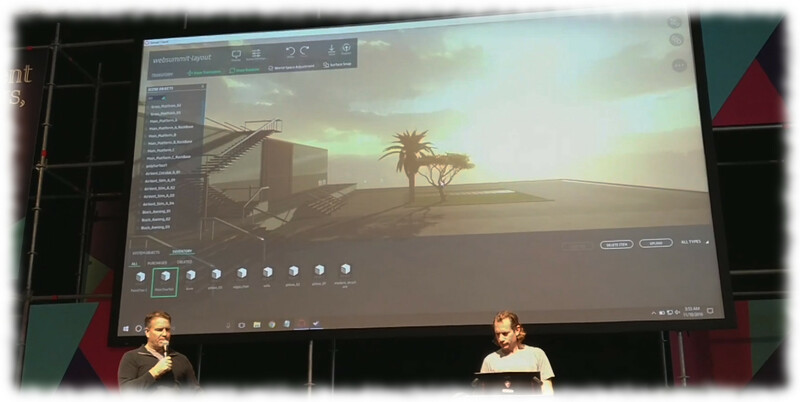 Is it simply indicating that the scenes are the result of collaborative work between the Lab and content creators / “content partners”, and simply a means to denote “pre-built” environments which will be available for people to explore when Sansar opens its doors to the public? Or might it be indicative of something else? Might the Lab be looking to sell its own scenes within the platform as a means of additional revenue generation? Or that “Sansar Studios” might be the marketing brand for the platform? Again, I’m not indicating a particular belief, I’m simply speculating as I write. I’m pretty happy with my lot in Second Life and – at this point in time – have no desire to own a VR HMD (something which might change in the future, depending on how the market and technology develop). Ergo, an outright move to Sansar doesn’t interest me (not that Sansar is intended to be any kind of “replacement” for Second Life – it isn’t. Hence why the Lab has said Second Life will continue well into the future). However, I do continue to see the potential for something like Sansar, particularly in those markets where the emerging “low-cost” VR tools could have significant impact: design, engineering, architecture, simulation, education, training, healthcare. These are very much the markets the Lab is looking at for Sansar. As such, even if the whole “social VR” thing falls flat on its face, I still hold the view that there are potential VR niches and audiences out there Sansar could occupy and be a success, just as Second Life has successfully occupied a niche and developed its own audience. At the start of 2016, I wrote about Telrunya – Forest of Dreams, a resign design by Nessa Zamora (Noralie78). It was a beautiful, tranquil place which I likened to an elven corner of Tolkien’s Middle Earth. Well, time has moved on since then, and places have changed; the Forest passed into the west some time in 2016. However, Telrunya’s spirit has now returned to Second Life in the form of a new design by Nessa, in a new location, and with a new name. Telrunya Winter, occupying the homestead region of Diamond Island presents visitors with a winter wonderland of snow, night skies, shafts of Moonlight filtering through frosted trees and the glow and scatter of winter lights. It is at once very different to the Forest of Dreams while at the same time bearing an echo of that build. From the landing point under the dome of a Victorian gazebo, visitors are invited to explore the region on foot or via ice skates – sets are available with snowballs at the landing point for a small fee. A frozen river offers plenty of scope for the latter, as it curls away from an ice-covered pond. And if you take the right direction, you might find a little surprise. For those whole prefer walking, the crisp, white snow is inviting of footfall, and walking across it, one can almost hear that soft, fresh crunch of it being compacted underfoot. Follow the stone-edged trail over a bridge and under bough, and you’ll find your way to a wood cabin. Here, light and warmth invitingly pour forth; fires burn brightly in hearths, warming rooms furnished with deep armchairs and sofas. For those not yet ready to come inside, another fireplace on the covered porch offers warmth to those wishing to use the bench alongside to sit in comfort and continue to appreciate the aurora-washed sky and the gently falling snow. South of the gazebo, across ice and snow, a low rocky plateau pushes upwards from the otherwise almost flat land, a table on which ancient ruins sit, arches lit by naked flames as they look out between the snow-draped shoulders of the high surrounding peaks. Elsewhere, strings of lights hang from the bare arms of trees, deer walk between moonlit trunks, lanterns glow and float through the air, giving the entire region a feeling of otherworldly magic, with places a-plenty to sit and ponder and enjoy, alone or with a friend or loved one. With winter closing around us in the northern hemisphere, it is traditional to see winter landscapes come to the fore in Second Life. Telrunya Winter is the first I’ve visited since the start of the year, and it certainly won’t be the last. However, it will be special, Nessa has a talent for creating places with a mystical air and feel, as Telrunya Winter amply demonstrates. It is a tranquil slice of winter not to be missed.